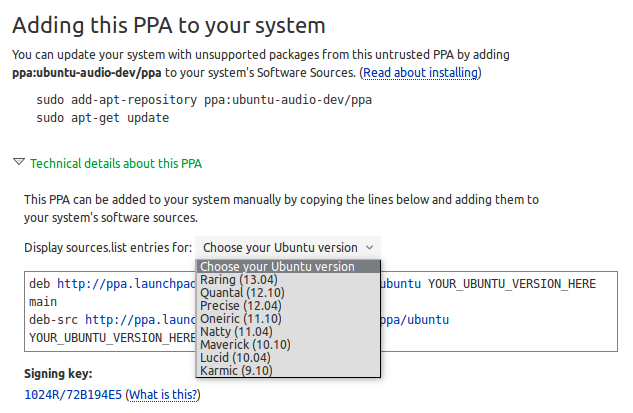 W: The repository 'http://ppa.launchpad.net/ubuntu-audio-dev/ppa/ubuntu xenial Release' does not have a Release file. I read a post saying the contents of /etc/apt/sources.list (see below) should be changed. Which lines need commenting out? Hit Save. Close the Gedit window. Not the answer you're looking for? Browse other questions tagged 16.04 apt repository or ask your own question. How can I fix a 404 Error when using a PPA or updating my package lists? How do I solve release file not found error? Why do I get this error message when I am trying to update? Why my kernel is not the latest for 14.04?